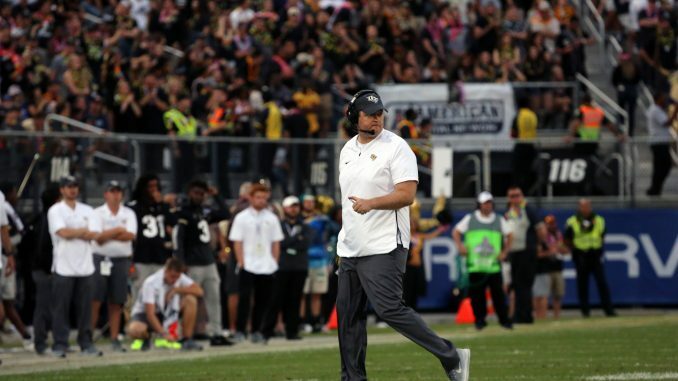 Just over one year since their first meeting, UCF and Josh Heupel have agreed to a contract extension that runs through 2024, UCF Athletics announced Friday. Heupel is nearing the end of what has been an impressive first season with the Knights. After the team went 13-0 last year under Scott Frost, the former Oklahoma quarterback had a tough act to follow. He delivered on the high expectations, leading UCF to an 11-0 regular season record and a second straight conference championship. At 12-0, the Knights were ranked No. 8 in the final College Football Playoff rankings. They will be headed to Arizona for bowl season, taking on No. 11 LSU in the PlayStation Fiesta Bowl on Jan. 1. The Knights faced their fair share of adversity this season. Aaron Robinson suffered a scary injury on the season’s opening kickoff. Hurricane Florence forced a week three matchup with North Carolina to be canceled. On Oct. 13, the team trailed Memphis by 17 points at halftime before coming back for a 31-30 win. An upset-minded Temple team held a halftime lead at Spectrum Stadium on Nov. 1, only to be outscored 24-6 in the second half. Then, of course, quarterback McKenzie Milton, a Heisman Trophy hopeful, went down with a gruesome leg injury in the regular season finale against South Florida. Redshirt freshman Darriel Mack Jr. entered and led the team the rest of the way before putting together a clutch performance in the AAC Championship Game, bringing UCF back from being down by as many as 17 to win the title game for the second straight year. Heupel, a first-year head coach, led the Knights through each step of adversity throughout the year. For his efforts, he was named as one of eight finalists for the 2018 Eddie Robinson Coach of the Year Award earlier this week.